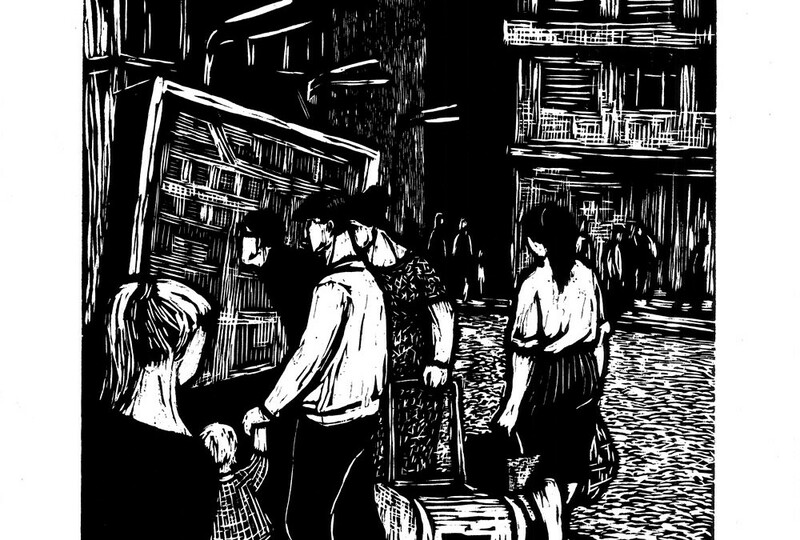 Xenia Eraclide Vreme’s artworks are mostly engravings, etchings and drawings. During her entire 50 years carrier she use most engraving and etching techniques. In the early years of her career she did wood engraving with the social subjects of that time, but soon after in according with the need to be free of the social pressure she starts to focus on the romanian folklore major legends and subjects, most of them in realized in etching. This period of her creation is an opening in international relations, the contract with Schindler Gallery Berna is a boom. Those years means an international success, most of her international activity is in Switzerland and Germany. The etching artworks are made in aquatinta and aquaforte, 3 or 4 colors from the same zink plate. It is an elaborate technique made in her own studio using a modify drying roller press as manual etching press. 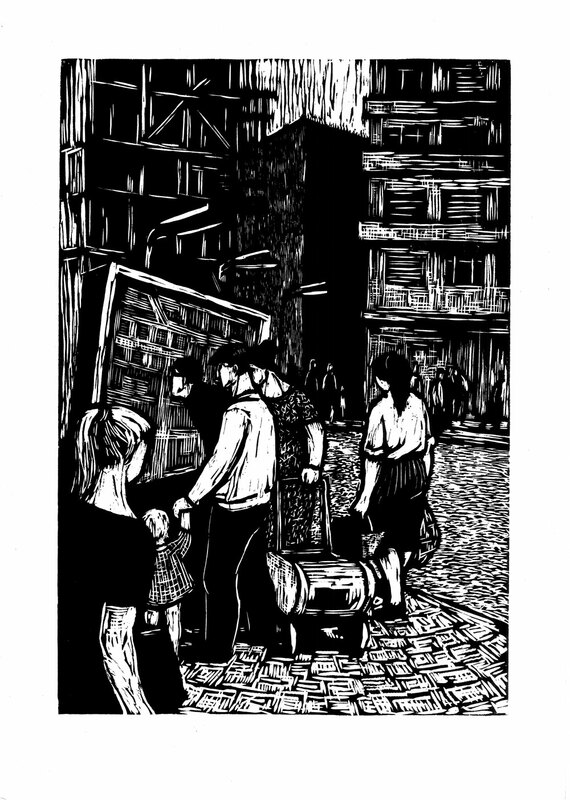 In the 80′s she change the etching techniques to mezzotinta and she is present in most mini print exhibition in Romania and Central Europe. In this period she starts to create abstracts drawings using ink, tempera on coated paper. So in the last period of her works the drawings became the main technique she use. She left a huge legacy of artworks, from mini prints to large artworks. She experimented color etching and etching on plaster, and glass painting. Also she dedicated a big part of her life teaching art in Timisoara Art School. 28 One-man shows: 1967 Art Gallery Timişoara, 1970, 1972 Vila Engiadina Gallery Vulpera (Switzerland), 1971 St. Louis Gallery Morges (Switzerland), 1972 Kunst Keller Kriens (Switzerland), 1972 Alfa Gallery Arad, 1972, 1977, 1984 Helios Gallery Timişoara, 1973 Kleine Galerie fur kunst, Kassel (Germany), 1973 Saulenhoffgalery Bad Pyrmont (Germany), 1974 Neushatel / Les Diablerets (Switzerland), 1976, 1981 Agora Gallery Reşiţa, 1978 Alfa Gallery Arad, 1980 Agora Gallery Reşiţa, 1981 Cluj-Napoca Art Museum, 1987 Cupola Gallery Iaşi, 1988 University House Timişoara, 1995 Timişoara Art Museum, 1996 UAP Art Gallery Târgu-Mureş, 1996 Dure Gallery Timişoara, 2000 Helios Gallery Timişoara, 2001 Art Gallery Hunedoara, 2003 UAP Art Gallery Bistriţa, 2003 Frezia Gallery Dej, 2004 Angel’s Gallery Drobeta T.Severin, 2005 Helios Gallery Timişoara. Romanian Representative Art Exhibitions: 1961 Viena/Austria, 1961 Moscova/Rusia, 1969 Novi Sad/Serbia, 1970 Belgrad/Serbia, 1973 Philadelphia/USA, 1973 Modena/Italy, 1974 Gratz/Austria, 1977 Dortmund/Germany, 1980 Maroc, Tunis, Alger, Egipt, 1982 Jena/Germany, 1983 Lymburg/Holland, 1984 Gera/Germany, 1985 Stuttgard/Germany, 1990 Szeged/Hnngary, 1993 Szeged/Hungary, 1998 Viena/Austria, 2001 Arte Incontro, Galeria Academia di Romania – Roma/Italy, 2002 Il futuro Ieri, Angello/Italy, 2003 Colectivi d artisti italiani e rumeni per stud. Aperti, Montecelio/Italy, 2007 Szeged /Hungary. Group Exhibitions: 1967 Tokyo, Kyoto, Nagoya, Nagasaki, Hiroşima/Japan, 1970 Schindler Gallery, Berna/Switzerland, 1973 Alto Center, Lucerna/Switzerland, 1974, 1977, 1981 Kunst am Markt Gallery, Hofgeismar/Germany, 1975,1977 Keller Atelier, Kuxhaven/Germany, 1975 Brockdorfpalais, Gluckstadt/Germany, 1974,1978 Gottingen Galerie, Gottingen/Germany, 1974, 1978 Northeim Galerie, Northeim/Germany, 1978 Thalwil/Switzerland, 1979 Galeria Lizsterhaus SZLT, 1980 Barsinghaus, 1980 Wattenscheid, 1981 Haus Coburg, Delmenhorst/Germany, 1980, 1986 International Etching Triennale Kracow/Poland, 1980, 1986, 1992, 1995 Eschenbach Gallery, Lucerna/Switzerland, 1982 Kunst Gallery, Gera/Germany, 1983 Laax/Switzerland, 1985 Kassel/Germany, 1986 Almend, 1990 Glattzentrum, Yurich/Switzerland, 1989, 1990 Del bello Gallery, Toronto/Canada, 1990 Orangerie Guga Parck, Essen/Germany, 1991, 1996 International Mini Etching Triennale, Fredrikstad/Norway, 1991 Galerie Boema, Viena/Austria, 1991 Merzing/Germany, 1992 Glattzentrum, Yurich/Switzerland, 1991, 1993 Mini Engraving Triennale, Chamaliere/France, 1992 Ascona, Agarone/Switzerland, 1993 Epizentrum, Essen/Germany, 1993 International Engraving Exhibition, Maastricht/Holland, 1993 Mannheim/Germany, 1995 Lucerna/Switzerland, 1996 Apollo Gallery, Bucharest, 1997 International Portrait Biennale, Tuzla/Bosnia-Herzegovina, 1997 Mini Print Biennale, Cluj-Napoca, 1997-1998 Profan-Gallery, Elst/Holland, 1997-1998 Oslo, Sandvica, Bergen, Moirana, Fiel, Risa, Tonsberg, Namos, Drobak/Norway, 1998 Rops-Namur Museum/Belge, 1998 Keys Gallery, Springfield/USA, 1998 Langerweche, Aachen/Germany, 1999 Balkanart, Artera Gallery, Varna/Bulgaria, 2000 Tg.Mures Art Museum, Elisabeta/George David Art Collection, 2000 Mini Print International Exhibition, Cărbunari, 2000 Mini Print – second edition Baia-Mare, 2001 Frezia Gallery/Dej, 2001 Blaj Museum, 2001 Florean Museum Mini Print Exhibition, Baia Mare, 2001 Mini Print International Exhibition Tokyo, 2002 Timişoara Art Museum Mini Print Exhibition, 2002 Cluj Art Museum, 2003 Group Exhibition Tg.Mureş, 2003 Baia Mare Museum Mini Print Exhibition, 2003 Reşiţa Museum, 2004 Oraviţa-Reşiţa, 2004 Jupâneşti, Faget, 2004 Timişoara, 2004 Florean Museum Mini Print Exhibition Baia Mare, 2004 Timişoara Art Museum Mini Print Exhibition, 2004 Connections, Budapest/Hungary, 2005 Cluj-Napoca Art Museum, 2005 Artis Gallery Bucharest, 2005 Timişoara National Theatre, 2006 Agora Gallery Reşiţa.